This new version Beta05 is more configurable for the user. The menu now can be re-sized and re-positioned (same size is used for all menus). Please read the html documentation in the \docs folder for details. I have included all the .mnu files which might be needed in the \docs\samples folder - this saves having to download them. The user can make his own menu changes by making his own \grub\mymenu.lst file (which is copied from the menu.lst file and then edited slightly). The user can then change mymenu.lst to change the colours, menu position and size, menu heading, bottom cyan text or re-order the menu items to list ISO files last rather than first. This means that when you update Easy2Boot in the future (with Beta06 tomorrow! ), you won't lose your changes - as your mymenu.lst file will not be overwritten and will be used instead of the default menu.lst file. Some small text tidying has also been done. will be fixed in BETA06 soon...! I've been looking for such a multiboot solution for days. I discovered Easy2Boot today and it's exactly what I was expected : drop your isos and it just works. Beta05 works fine for what I have tested (ubuntu / systemrescuecd isos). * At early boot, is it possible to get rid of the 5 sec "press hotkey to boot previous mbr" page? Anyway, thanks for your great work (and the people on reboot.pro), and for the tutorials! to remove the 5 second delay - install with RMPrepUSB or use grubinst with the -t=0 parameter. the grub4dos black&white menu is due to having no menu.lst in the root. I will re-instate this for BETA06. I also will add a 'patchme' file which removes all the grub4dos boot-up messages! On a real system or VM it is just a second or two... very slow on QEMU! Easy2Boot is free for all to use - please refer people to www.rmprepusb.com website for latest version, etc. and reboot.pro for discussions. 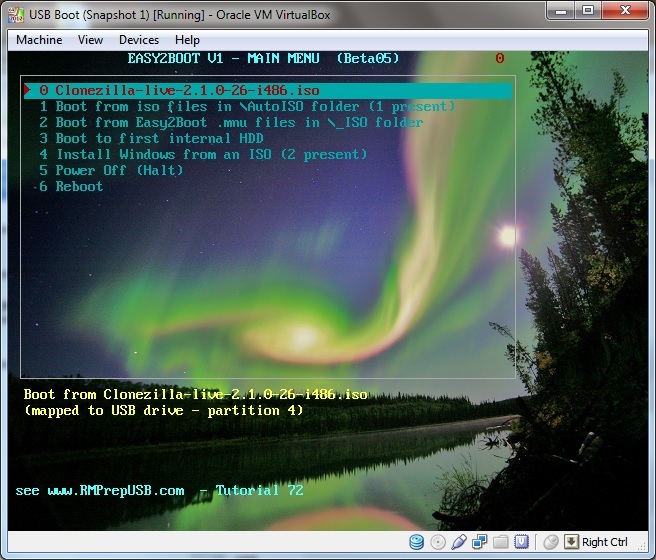 For testing the menus, I use Oracle VM VirtualBox Manager and boot directly from my USB 3 flash drive via my USB 3 port - from start of VM (after F12 to boot message) to main Easy2Boot menu it takes less than a second. You're right it's A LOT faster! Thanks. I don't know why KVM is so slow.